Dave Cournoyer is an award-winning writer and communications professional based in Edmonton, Alberta. He currently works as a Communications Advisor with the United Nurses of Alberta. Daveberta.ca was launched in January 2005 and quickly became one of the best read political blogs in Alberta. In 2017, he joined Ryan Hastman and Adam Rozenhart to launch the Daveberta Podcast. Dave currently serves on the Progress Alberta advisory board and is a past member of the programming committee for Edmonton’s Litfest, the board of directors of the Gateway Student Journalism Society, the Kokopelli Choir Association, the Central Edmonton News Society, and the board of directors of the Bellevue Community League. Dave is also a regular member of CTV’s Alberta Primetime politics panel. 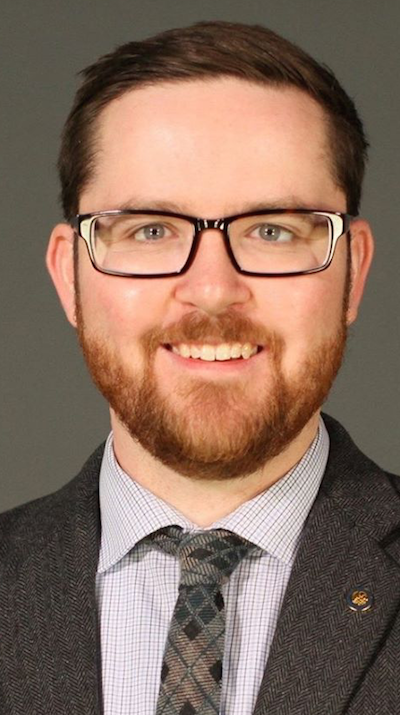 Earning a Bachelor of Arts in Political Science and History from the University of Alberta, he was elected Vice-President External of the Students’ Union, served on the University Senate and as chairperson of the Council of Alberta University Students from 2006 to 2007. Dave was an active member of the Alberta Liberal Party from 1999 to 2008, during which time he worked in various communications and organizing roles for the party and caucus. He was a member of the Alberta Party from 2009 until 2012 and served as secretary of the Edmonton-Centre constituency association. While he continues to support progressive causes, he is currently not a member of any political party. In 2003, he was awarded the Queen’s Golden Jubilee Medal in recognition of his volunteer work with the WarAmps of Canada and in 2010 he was named as one of Edmonton’s Top 40 under 40 by Avenue Magazine. He was recognized in 2015 at the Edmonton New Media Awards (the Yeggies) with the Best Political/Current Affairs Award and a Special Lifetime Achievement Award for a full decade of blogging about Alberta politics. Dave has presented lectures about Alberta politics to classes at the University of Alberta, MacEwan University, King’s University College, and Carleton University in Ottawa. He has presented communications and social media workshops to numerous organizations, including the Catholic Archdiocese of Edmonton, Canadian University Press, Canadian Association of Labour Media, Public Interest Alberta, the Canadian Federation of Nurses Unions, Next Up, Alberta Federation of Labour, the Canadian Labour Congress and Homeward Trust Edmonton. He is a member of United Steelworkers Local 1-207. He lives in Edmonton with his wife, son, and their dachshund, Max. You can follow his tweets at @davecournoyer, follow his blog on Facebook, and peruse through his photos on Flickr. Fan letters can be mailed to david.cournoyer@gmail.com. Good site Dave. I will it follow more often. Thanks for the comment, Gary. That’s a good suggestion and I will look into it. There is a candidate name Hakin Isse running for ward 3. His represents change and sign of prosperity for people living in that ward. If you are interested, i can set-up a meet with him to ask questions. I had Harvey Panesar at my door the other evening and there were a couple of concerns that came about in how he was comparing himself with other candidates for this ward. Harvey went on to use other candidates ages and health conditions as to why he was a better person to vote for such as one candidate being 65 and being diabetic. I am not certain as to why as person older age and being a diabetic would make a difference. What is the rest of this persons resume, perhaps it is full of experience, more than what Harvey may have. Also, on Harvey’s website he makes mention of his wife in this paragraph “Panesar, 37, alongside his wife, Taranjeet, daughters, Arya and Riya, and newborn son, Jujhar announced his candidacy Saturday at Pind Punjab Restaurant in front of his supporters.” yet on his brochure he is handing out door to door it shows his wife’s name as Sundeep. Then the guy is showing his support for violence against women on his web page yet he owns a business by the name of Aggression Fighting Championship… really? Good morning, Dave. On the wider civic election front, I have a name for you who knows something about Grande Prairie: Dr Daryl White. Dr White is an instructor in the Faculty of Arts & Education at Grande Prairie Regional College, and he has started a high-quality, unbiased civic election website describing the issues, and about the candidates for Mayor & Council (unfortunately, he has not yet been able to post any information about the County of Grande Prairie No 1). Proud to see you on television tonight as well as reading about you over the years. I am so happy to see you doing so well. Good luck! Great website Dave. Keep up the good work! If you’re ever interested in reading some old documents from the UFA and Social Credit governments, let me know. It’s name confusion on your website regarding the NDP candidate in Calgary-Lougheed. It seams to be two different persons in Calgary with the same name. The NDP candidate is a Civil Engineer working in the Construction Industry not the Oil and Gas person working for Husky Energy. Please do the appropriate correction in your website. Edmonton Meadowlark candidate Steve Benson is a great guy! he has a webpage too. http://www.steverbenson.com Go check him out! He’s also the only candidate who lives in the constituency. You can remove other PC candidates’ names from Calgary-Fort. I will be the nominated PC candidate for that riding. Thanks. Wondering why when the economy was good a few years ago and oil was 120.00 a barrel why didn’t they pay more royalties then??? That money could have helped when problems did arise in later years. Getting tired of the same old excuse that more taxes to corporations will kill business! Just reviewed the platforms of all 4 parties. Who knew that the NDP and the Wildrose had so much in common? Huh! Guess the “Wilds” aren’t so “extreme” after all. Dave.. Love your blog , good commentary on the Alberta Election. What I have found to be very interesting.. Is no party or candidate has addressed the real issues about corporate taxes. Change takes fortitude. why.. it would mean a change in law, affecting Justice dept. Specifically law around collections on Corporate debt. CRA has collection law, if the Corporation does not pay CRA Siezes Corporate Assets and FINES the Directors responsible and or Put’s them in JAIL. Essentially ALBERTA FINANCE has no Defined Corporate Tax Collection Law. SO bottom line Instead of raising the rate.. Collect the Corp taxes rather than writing them off. Why has no one made an issue of the Corporate tax Write offs, and Corporate tax Dormant (non Collected ). Older than 3 years in age. The next issue, is MEP (maintenance enforcement) has the legal right to suspend all human rights, and charter rights within it Examination process. The quasi judicial bodies (human right commission and MEP ) both need serious Public Oversight and restrictions on the position of Suspending Charter Rights. Has anyone come across a concise comparison of the parties’ for/against stances on the issues? This would help people make more informed choices, even if they don’t have time to read through the published platforms.I assume it’s out there somewhere. I am wondering why you do not bring up the or discuss further the plan for more refineries by the ndp. Who would pay for that? I don’t not think the oil companies would invest and the raise in corporate taxes would not pay for refineries to be built. I would like to see more information on ndp affiliation with the unions. Ms. Notley’s husband is th communication officer for CUPE. Building refineries is a plus for the AFL. The candidate for our riding is a union president! Yet Rachel Notley says the ndp will ban corporate and union donations. How exactly would that work? Whats your stance on Alberta’s..Privacy..Act..?…..